The exhibit Envisioning Technologies will launch at 4pm on Friday, October 14th at the Department of History of Carleton University (4th floor, Paterson Hall). It will follow the second public Shannon Lecture, given by Dr. Melanie Panitch of Ryerson University (to be held in MacOdrum Library). 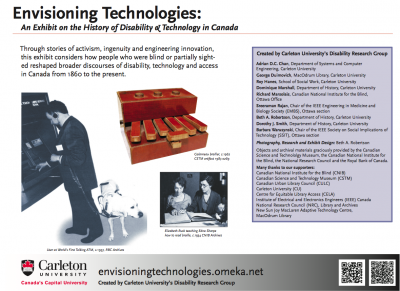 The exhibit is the latest creation of Carleton University’s Disability Research Group. It will include six panels, equipped with QR codes that can be scanned to access the text, as well as the virtual version of the exhibit. 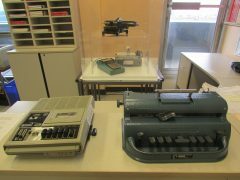 In the main office (400 Paterson), interested people can read the braille text of all exhibit panels (courtesy of Richard Marsolais), as well as engage with a touchable display of objects from the CNIB and the New Sun Joy MacLaren Adaptive Technology Centre of MacOdrum Library. 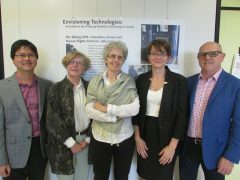 A glass-case display of objects from the Canadian Science and Technology Museum will also be present. If you require additional guidance to the exhibit or have any questions, please let us know by emailing Dominique.Marshall@carleton.ca. This exhibit is also intended to travel. If you have any ideas of potential future locations, please be sure to let us know.